Authentic French food is something hard to find outside France (and sometimes inside France!) La Muse in Islington, has that local rustic feel, open brick work and candle light. The menu is simple, short, it almost under played the food that we were about to be served. The wine list is all French wines and a good selection by the glass. We started with a charcuterie board, artisan breads, meats, cheeses, the most meaty chunky terrine, and a few more accoutrements. We were recommended a possibly controversial, robust Sauvignon Blanc to go with it, it worked. Now, the bread, you have already won me over if you start with a good bread, and this was laced with rosemary standing up to that wonderful terrine..
We moved on to some starters.. yes that was just an appetizer! We had; the steak tartare with egg yolk beautifully balanced on top, a goats cheese tower with figs, samphire with poached egg and bacon. 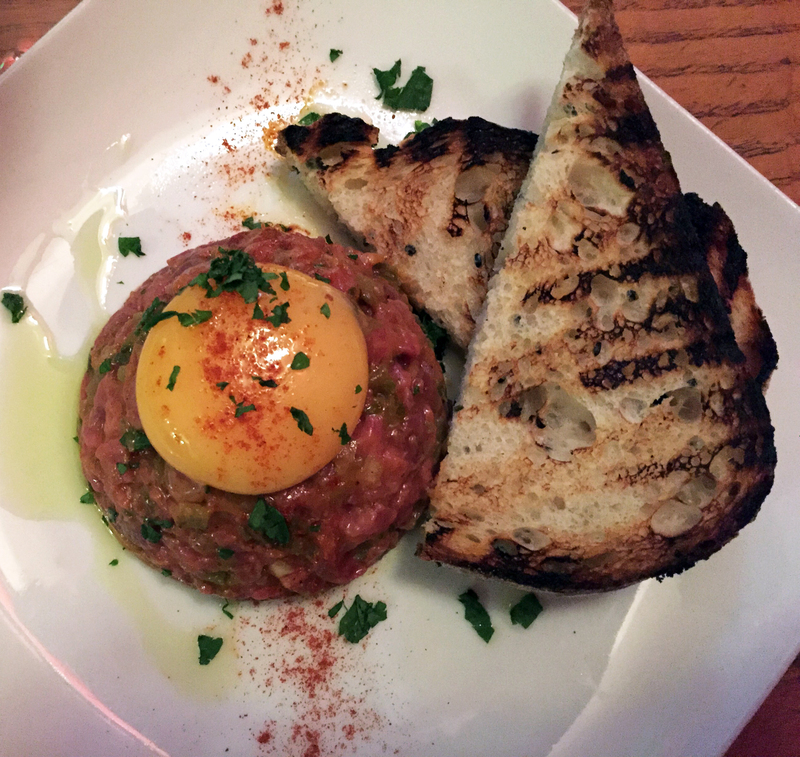 French are known for their rich full flavours and for me that steak tartare was ticking all the traditional French boxes, the meat so lean with that tang of worcestershire sauce and the richness of the egg, I was in heaven. Lewis’ favourite, but only just was the goats cheese tower warmed but still holding its shape with caramelised figs on the top and a jus drizzled around it. Again, incredibly rich but that’s traditional French for you, therefore totally appropriate. 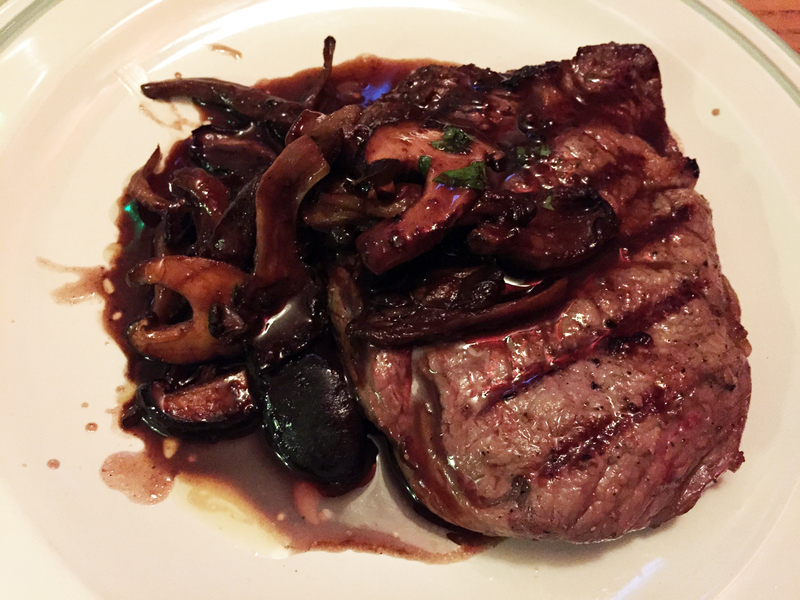 Next we moved on the mains, how can you resist a rib eye steak, with wild mushrooms and a red wine jus, and stone bass with roast vegetables. Steak and chips for £17 + £3 the sauce and chips alone was worth it. The whole plate was so full flavoured and moreish, completely satisfied my steak and chips craving. Stone bass is not a fish I have had before, it is the most meaty rich (you can see a theme here) fish I have had. Perfectly cooked with some roast vegetables and a taste of Dijon mustard in the background. 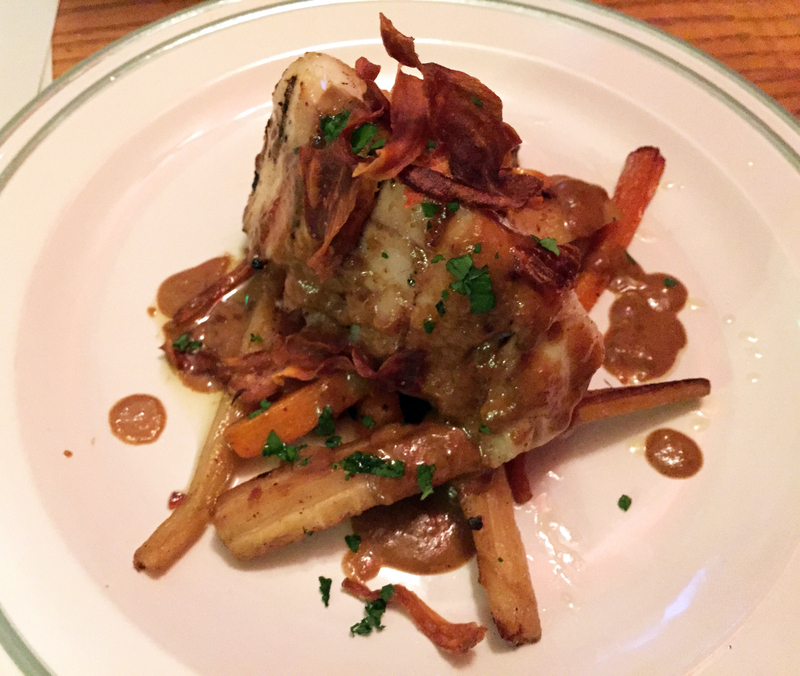 This is not a dish to be ordered if you are looking for a light fish dish! Finally, and I’m not sure why we shared a dessert, a slightly tipsy decision.. 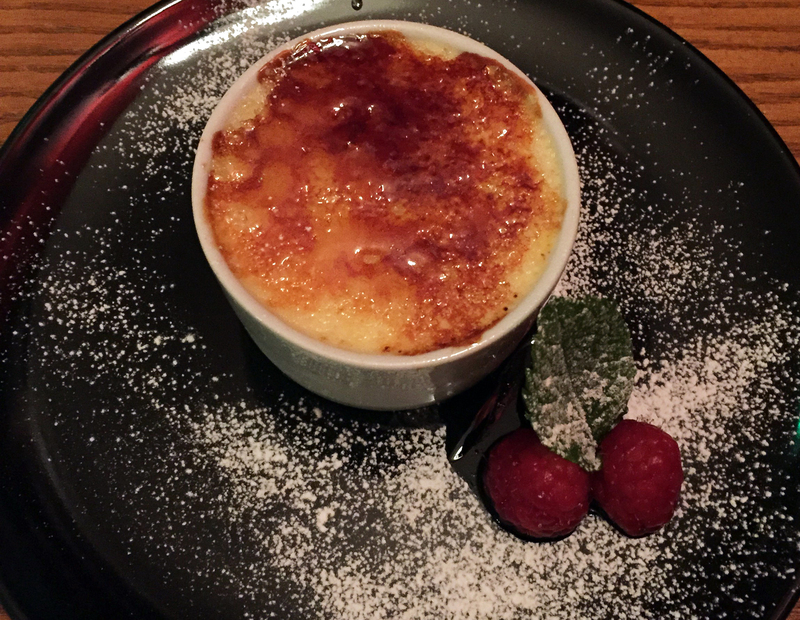 The mascarpone crème brulee with raspberries, mascarpone takes away the light custard feels of a traditional crème brulee and gives it a heavier flavour, it is lovely and the mascarpone really comes through, but with everything we have just eaten.. maybe a lighter dessert could have been a better option! Overall what a treat; three course dinner for two (£80-85 including service), great place for a date, really good value for money, traditional French restaurant, whether you are local or not, it is worth making the trip for. Also pretty excited about their brunch/lunch menus definitely what to try those as well. Ohh all the food looks so lovely! Soo glad you had a good time at La Muse!